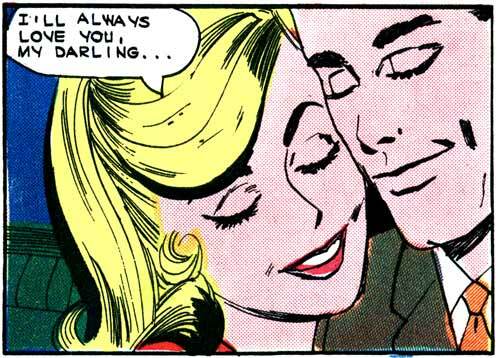 Art by Vince Colletta Studio from the story “Surprise Party” in FIRST KISS #40, 1965. SCENE: Man and woman happily cheek to cheek. MAN: Oh, my! What is this strange feeling? …said conjoined twin Sally shortly before the surgery that would separate his ear from her temple. Jam, prenups are always silly—until you need one. So they’re like wives then?